Hi beauty! Where are the next Clinique, Estee Lauder and Lancome Gift with Purchase? Here’s the list of Estee Lauder Gift with Purchase, Clinique Gift with Purchase and Lancome Gift with Purchase in US, UK and Canada from IcanGWP.com – gift with purchase blog! The only beauty blog that hunts all upcoming and schedule for Clinique, Estee Lauder and Lancome gift with purchase 2018 for you! Welcome to our niche and enjoy the deals! NORDSTROM will have Spring Estee Lauder gift with purchase + step up gift coming this week or mid April 2019. Macy’s should have a new Spring or Mother’s Day Estee Lauder purchase with purchase coming mid April 2019. Stage Stores will have their spring Estee Lauder gift with purchase with step-up gift coming at the end of April 2019. Saks Fifth Avenue may have their Clinique gift with purchase coming mid April 2019. Clinique USA and Von Maur should have their Clinique gift with purchase coming mid April 2019. Dillard’s should have their spring Lancome gift with purchase 7pc with $37.50 coming around mid April 2019. Bloomingdales should have their new Lancome gift with purchase coming mid April 2019. Boscov’s should have their new Lancome gift with purchase 7pc with $37.50 coming around late April 2019. Macy’s should have a new Lancome gift with purchase coming mid May 2019. I am happy you are here. Visit icangwp.com main page for the most up-to-date updates! Bluemercury (NEW) Receive a free 10-piece deluxe Conscious Gift Bag with any $125 purchase. See what’s in the bag here. Receive a free palette ($48 value) with any purchase of Lune + Aster mascara or lash primer (starting from $18) use code QUAD. Free baked bronzer with any purchase of Lune + Aster BB or CC cream use code: BRONZER. A $32 value. Choose 3 free samples at checkout with any order no minimum. It’s combinable with all Bluemercry Gift with Purchase offers! Free shipping all order no minimum. New Arrivals Use code WELCOME10 to get 10% off. From 23rd April (online early access) to 29th April, Space NK US is offering a gift with purchase, Essential beauty bag with any $165 purchase USE CODE GIFT19. Worth over $250, this 18 piece luxe gift with purchase beauty bag features Space NK’s curated edit of skincare, makeup and haircare including bestselling and new products from Oribe, Dr Barbara Sturm, Briogeo, Surratt, Tata Harper and more. Step Up Gift at Space NK USA. This year Space NK USA has a great step-up gift! Make sure you grab it quick! GIFT 2: With an additional $30 spend (totalling a $195 spend) customers have their choice of either the Omorovicza Moor Mud Cream Cleanser (Full Size, value $80) or Omorovicza Queen of Hungary Mist special edition (50ml, value $45). Space NK US Receive a complimentary Philosykos Mini Soap & Figuier Mini Candle when you spend $100 or more on Diptyque. No promo code needed and combined with the next gifts. (NEW) Visit gift with purchase offers at Space NK here. Choose 3 free samples at checkout. Free shipping on any $50 purchase. Remember, you will receive $5 points every $100. Make sure you enroll to a free membership program NDulge. Sign up for free here. Free shipping on any $50 order. See New In. Space NK exclusives. Visit Space NK Nordstrom, Space NK birthday gift! Get a complimentary full-size Natura Bisse Diamond Cocoon Ultimate Shield Mist $125 when you buy the Natura Bisse Diamond Cocoon Skin Booster Concentrate $250. This GWP will automatically be applied on the Shopping Bag Page. NORDSTROM (NEW) Free Luxe Gift with Purchase, yours when you spend $150 on beauty or fragrance, a $153 value. Online only. (NEW) GIFT 2: Spend $200 on beauty or fragrance and you’ll also receive a three-piece bonus gift: SK-II Facial Treatment Essence (1 oz. ), Fresh Crème Ancienne Soft Cream Ultimate Ageless Complexion Treatment (0.24 oz.) and AMOREPACIFIC Time Response Skin Reserve Gel Crème (0.2 oz. ); a $284 combined value. GIFT 1: Choose a Free Gift (up to $170 Value) with Your $37.50 Estee Lauder Purchase, use code HYDRATE or LIFT. (2d) GIFT 2: Spend $75 on Estée Lauder and also receive a full-size Sumptuous Extreme Lash Multiplying Mascara in Extreme Black (0.27 oz.) and Pure Color Envy Sculpting Gloss in Reckless Bloom (0.2 oz.). Estee Lauder LIMITED EDITION Colors of Spring $42.50 with any purchase. Over a $130 Value! Choose your Collection: Blushing Lips or Shimmering Eyes. Includes 3 full sizes and more plus a spring cosmetic bag and tote. Perfect to gift—or to keep. GIFT 1: Receive a cosmetics bag and deluxe samples of Pop Lip Color + Primer in Blush Pop (0.08 oz. ), Moisture Surge 72-Hour Auto-Replenishing Hydrator (0.24 oz. ), Pep-Start Eye Cream (0.1 oz.) and Moisture Surge Hydrating Supercharged Concentrate (0.5 oz. ), plus a single-use Clinique iD: Dramatically Different Hydrating Jelly + Concentrate, with your $40 Clinique purchase. (NEW) GIFT 2: Spend $55 on Clinique and also receive deluxe samples of Pretty Easy Liquid Eyelining Pen in Black (0.01 oz.) and High Impact Mascara in Black (0.14 oz). (NEW) GIFT 3: Receive a blush brush and a deluxe sample of Moisture Surge 72-Hour Auto-Replenishing Hydrator (0.5 oz.) with any Clinique foundation purchase. Receive deluxe samples of Crème de la Mer Moisturizing Cream (0.24 oz. ), The Renewal Oil (0.17 oz. ), The Concentrate (0.1 oz.) and The Eye Concentrate (0.1 oz.) with your $300 La Mer purchase. Receive a cosmetics bag and deluxe samples of PREVAGE Night Anti-Aging Restorative Cream (0.5 oz. ), PREVAGE Anti-Aging Daily Serum (0.17 oz. ), SUPERSTART Skin Renewal Booster (0.17 oz. ), Advanced Ceramide Capsules (0.11 oz. ), Grand Entrance Mascara in Stunning Black (0.09 oz.) and Beautiful Color Liquid Lip Gloss in Cheeky (0.08 oz.) with your $50 Elizabeth Arden purchase. A $106 value. LANCÔME Parisian Glow Collection $45 with any Lancome purchase. A collection of six full-sized bestsellers for a picture-perfect look —a $219 value. Pop-in Shop: Earth Day Everyday – see all Sustainability products. See all Nordstrom gift with purchase. Choose 3 Free Samples with any beauty Purchase no minimum at checkout. See Nordstrom Beauty Sale Page here. Nordstrom beauty & fragrance new arrivals here. (HOT) Dyson airwrap restock at Nordstrom! Pop-In Shop Hatch or Pop-In Beauty Shop. LANCÔME Parisian Glow Collection $45 with any Lancome purchase. A collection of six full-sized bestsellers for a picture-perfect look for just $45 with any Lancôme purchase—a $219 value. La Mer The Miraculous Glow Set $250. Clarins Starter Kit (7-piece) $25 ($55 Value). Restock: MDNA SKIN x Moschino Runway-Ready Essentials Travel Kit $95. Ulta (NEW) Choose your free 11pc gift with $65 purchase from 3 options, over $115 value. (1d) Choose your FREE Tote with any $40 fragrance purchase (offer valid 4/21/19-5/12/19 or while quantities last) (2d) Ulta Beauty Skincare Superstars $9.99. (3d) use code BECCA20 for 20% off ALL Vita Liberata, ends 4/25. (1d) Receive $3.50 off $15 purchase use coupon 756875 (exclude prestige brands) any qualifying purchase – printable version coupon here, ends 5/11. Ulta has a new limited edition box: Ulta Beauty Pamper Yourself Bath & Body Must Haves $9.99. Visit New Arrivals, Skincare. Visit Ulta Buy More Save More list page. Ulta Best Seller Sale Page. See all Ulta gift with purchase offers, Ulta Sale Page, Ulta coupon, Ulta birthday gift (changes each quarter). Free shipping on any $50 purchase. 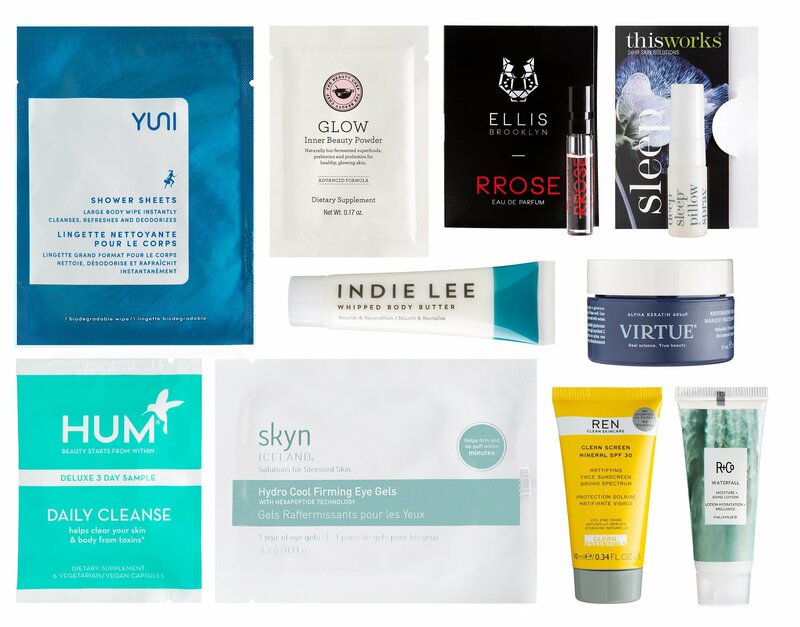 BeautyHabit (NEW) With your $150 or more SITEWIDE purchase, receive a Standard Baggu Bag (assorted) PLUS an 18 piece gift that includes full sizes and deluxe samples of some of our favorite Natural and Organic brands. Sampler substitutions may apply. Over an $180 value! Apply code: EARTHDAY at checkout. This year with any purchase from qvc.com/beauty-with-benefits at QVC, you will get a free 13-piece QVC Beauty With Benefit Gift Bag worth at least $203. When you shop this event for cosmetics & more donated by top brands, 80% of your purchase price benefits Cancer and Careers. Use code TAKE10 or HELLO10 to get a $10 discount for new customers. 5 off Your First Order With Code FIVE4U Limited Time including all beauty or try: $10 off use code TEN4U. Neiman Marcus just dropped three Neiman Marcus Curated Travel Bags $75 – $90. Combined with the next coupon. (NEW) Neiman Marcus Women’s NM Curated Travel Bag $90. (NEW) Use code CHANEL to get free Chanel Rouge Coco Flash + Top Coat Traffic sample with any beauty purchase. Always free shipping all orders. They have several brand specific GWP, see all gift with purchase. Barneys New York See all Barneys Beauty Boxes (contains all full-size products – no sub). See all available GWPs here. Through 4/23: FREE SkinStore Beauty Bag (worth $134) when you spend $150+ (no code needed), ends 4/27. (4d) Friends & Family Exclusive: Save 30% on select brands with code FF30, ends 4/22. (4d) Friends & Family: Save 25% sitewide with code FF25. Save 25% on 25 Must-Have Beauty Products with code SKIN25. 30% off 30 selected items with code SKIN30 including Sunday Riley Good Genes, 3Lab or Decorte. See all official coupon codes here. See all limited edition beaty boxes here. See all official gift with purchase here. See clearance and sale here. Top brands: SkinCeuticals, The Ordinary. Lord + Taylor Extra 30% OFF almost everything + 15% OFF almost all beauty including sale items, Use Code FRIENDS. Lancôme is 15% off, Exclusive Free Gift + Free Shipping, Customize your 7-piece gift with any Lancôme purchase of $39.50+. Up to a $93 value. Step up: Spend $75+ and receive your choice of 3 additional beauty essentials from 5 options. Total Gift Worth Up to $168. See all beauty gift with purchase offers. Saks Fifth Avenue (NEW) GIFT 1: Receive a 7-pc gift with any $40 Clinique purchase use coupon code “CLINIQ7SF”, a $127 value. (NEW) GIFT 2: Plus, receive a Surge + Mascara Bundle with any $50 Clinique purchase use coupon code “CLINIQ6SF”. (NEW) GIFT 3: Plus, receive a Full Size Moisture Surge™ 72 Hour Auto Replenishing Hydrator (1.01 oz.) and a Moisture Surge Overnight Mask (1.01 oz. )* with any $65 Clinique purchase use coupon code “CLINIQ8SF”. (NEW) GIFT 4: Plus, receive a Super Step Up Limited Edition Gift Tote Bag* with any $85 Clinique purchase use coupon code “CLINIQ9SF”. (NEW) GIFT 1: Free Moisturizing Soft Cream Luxury Sample with $250+ La Mer purchase use coupon code “LAMER10SF”. (NEW) GIFT 2: Receive a Skincolor Packette* with any $25 Beauty & Fragrance purchase use coupon code “LAMER8SF”. (NEW) Receive free gift with $350+ La Prairie skincare purchase use coupon code “PRAIRIE13SF”. (3d) Receive a Pink Diamond Magic Gel Night Deluxe* with any $25 Rodial purchase. Use code RODIAL6SF at checkout. (NEW)(HOT)(VERY RARE) Give a $300 E-Gift Card, get a $50 E-Gift Card for yourself (or give $150 and get a $20 E-Gift Card), ends 5/12. See all stackable free gift with purchase at Saks Fifth Avenue (coupon required). See beauty department at Saks. See beauty clearance. Visit Saks OFF 5TH. See all sale. Free shipping on any order use code freeship. Revolve Revolve is offering so many Revolve limited edition beauty boxes. Revolve (NEW) Revolve x Pony’s Play Box Makeup & Skincare Essentials $130. A $198 retail value. Free shipping and returns on any order. Sign up and get 10% off coupon code! GIFT 1: Receive a FREE Elizabeth Arden 7 Piece Spring Gift with any $37.50 Elizabeth Arden purchase, a $106 value. YOUR CHOICE of Beautiful Color Bold Liquid Lip Gloss in Cheeky or Pretty Obsessed. GIFT 2: Free full size Elizabeth Arden SUPERSTART Probiotic Cleanser with $85 purchase (a total $140 value gifts). (NEW) GIFT 3: Free full size Elizabeth Arden Ceramide Lift/Firm Eye Cream Super (worth $54) Step Up GWP with $125 purchase. $194 Total value. There are five new Spring 2019 Macy’s Beauty Kits! See all Naturals Beauty like Bareminerals, Caudalie, Burt’s Bees, Koh Gen Do, Korres, Origins, Rituals, Sun Bum, Sunday Riley, Tarte, Tony Moly and more. Choose from 5 skincare beauty boxes or 4 makeup beauty boxes for $10 with $40 beauty purchase. See all beauty Clearance at Macy’s here like 40% off Murad, Peter Thomas Roth or Bareminearals. Free shipping on $49 beauty order. See current Gift with purchase at Macy’s. Visit official Macy’s coupon page. GIFT 1: Estee Lauder Online pre-sale starts 4/22/19 through 4/29/19. Pre-sale items purchased within these dates will begin shipping on 4/29/19. Receive this free, seven-piece gift set with an Estee Lauder purchase of $37.50 or more. (NEW) GIFT 2: Estee Lauder 3-pc. Advanced Night Repair Gift with Purchase. See all official coupon codes at their Stage Stores Deals page here. Free shipping on any $75 order. Bloomingdales Beauty Benefits for Mother’s Day 2019 has begun! Snap up 60 free gifts with purchase from your favorite makeup, skincare and fragrance brands . Ends 5/5. You can get $250 gift bag with $165 + free full size Omorovicza gift from Space NK inside Bloomingdale’s here or get it directly at Space NK US use code GIFT19. (NEW)(HOT) Check out 60 new Bloomingdales beauty gift with purchase here. Loyallists get 5X points in beauty! Offer valid 4/23-5/5. Free shipping on $50 beauty purchase or free for Loyallist members, join free here. First time ever, Bloomingdale’s dropped exclusive Bloomingdale’s beauty box contains beauty brands like Becca, Estee Lauder and more! Receive your choice of an exclusive tote with any $125 cosmetics or fragrance purchase. Choose one from the following: Tan, White or Blue. (NEW) GIFT 2: Receive a 7-piece gift with any $55 Lancome purchase (a $107 value). (2d) GIFT 1: Receive deluxe samples of Hypnôse Drama Instant Full Volume Mascara and Monsieur Big Mascara with any $50 Lancome purchase. (2d) Buy One, Get One Free on Lancôme Color Design 5 Shadow & Liner Palette $50 from 19 options. (NEW) Receive deluxe samples of Charlotte’s Magic Cream Treat & Transform Moisturizer and Magic Eye Rescue Eye Cream to Turn Back the Clock with any $150 Charlotte Tilbury purchase. (NEW) GIFT 2: Receive your choice of a full-size Re-Nutriv product with any $125 Estee Lauder purchase. (NEW) GIFT 1: Receive your choice of a beauty duo with any $75 Estee Lauder purchase. Free shipping on $50 beauty purchase or free for Loyallist members, join free here. Visit Beauty sale, Bloomingdales promo code or see all beauty gift with purchase here. Belk (NEW) FREE 8-Piece Gift with $60 Clinique purchase. Cult Beauty (NEW) Cult Beauty x Wayne Goss Limited Edition beauty box £140 (including free international shipping). A £238 value. It launches at 12pm on Monday 29 th April 2019. Waitlist sign up here. See Cult Beauty brand specific gift with purchase offers (no coupon needed) this week. Non-EU shopper will get ~ 17% off! Use promo code YOU15 to get 15% off your first purchase of £20 (when you sign up to their newsletter and fill in the profile). With any £50 order, receive luxury free samples at checkout. Standard Delivery is FREE worldwide on all orders over £40. United States: FREE SHIPPING on all orders over £40. Anthropologie (NEW)(HOT) Receive a beauty gift with any full-price online beauty and/or wellness purchase of $75 or more ($105 value). Automatically added to cart while stock last. (NEW) 20% off full-price clothing through 4/23. (1d) Free shipping on any $100 purchase. See top rated beauty here. See all sale. See all beauty. Sephora and Sephora.ca (NEW)(VERY HOT) Sephora Favorites Sun Safety Kit $39 and it’s $114 value! sephora.com/product/sun-safety-kit-P444459. See Sephora Sun Safety Kit 2019 review here. The biggest Sephora Sale Event, Sephora Spring Bonus Sale April 2019, is coming. VIB ROUGE: April 26 – May 6 and use code: HEYROUGE for 20% off, VIB and Beauty Insider: May 2 – May 6 for 15% off use coe HEYVIB and 10% off use code HEYINSIDER, respectively. Sephora Favorites Wellness Kit $39 ($55 value). Sephora VIB coupon codes 2019. Birchbox (NEW) Birchbox The Nail Refresh Kit $30 (A $73.00 value). It includes two full size Smith & Cult Nailed Lacquer – Doe My Dear and Forever Fades Fast ($18 each)!! Use code FIRST15 or TAKE15 to get 15% off $35 purchase for these boxes. (NEW) Free deluxe sample duo with qualifying purchase of $35+ of full-size products from the Birchbox Shop. Use code: ORIBEDUO. See all coupons for free gifts with purchase from the Birchbox Bonus Shop! (NEW) With $50 purchase you can: Get this organizer for free when you spend $50+ on full-size product(s) in the Birchbox Shop. Just use code ORGANIZING at checkout. Get this 5pc makeup set from MAC and Beautyblender for free when you spend $50+ on full-size product(s) in the Birchbox Shop. Just use code MACBLEND at checkout. Get this Mystery Birchbox free with any $50+ purchase in the Birchbox Shop. Just use code MYSTERY at checkout. See Birchbox Limited Edition Box here. See Birchbox discover kits here. See all coupons for free gifts with purchase from the Birchbox Bonus Shop and add a FREE mystery sample pack with any full size $35 products order. Use code FIRST15 or TAKE15 to get 15% off $35 purchase for these boxes. Lookfantastic US, CA —Look Fantastic Beauty Egg Collection Box 2019 or Lookfantastic Easter Egg Beauty Box 2019 or for UK site is available now $90 ($76.50 with coupon). Worth $275 or £250. lookfantastic 5-piece Beauty Bag (Worth $65) when you spend $120, Ends: 4/25. (NEW) FREE Mystery Beauty Box (worth over $90 ) with purchase of 6- or 12-month Beauty Box Subscription. Use code BBMYSTERY. (4d) Save $35 when you buy 2 beauty eggs for $145 with code EGG145 (worth $658) . (4d) Get $7 off the Beauty Egg for only $78 (worth $329) with code EGG5. Look Fantastic Beauty Egg Collection Box 2019 or Lookfantastic Easter Egg Beauty Box 2019 is available now $90 ($76.50 with coupon). Worth $275 or £250 – but it will only cost £65. Estee Lauder (NEW) Estee Lauder Après Sun by Violette $85 Good to glow. 8-piece collection. Worth over $155. Walmart (NEW) See all 8 Walmart Beauty Favorites Boxes 2019 $9.88. One time purchase. Amazon (NEW)(VERY HOT) Three new beauty boxes – no sub. NewBeauty BeautyReport Sample Box : Stop the Clock Edition $24.95. The Bay Canada(NEW) Your gift with any Clinique purchase of $39 or more. Available at checkout. (5d) GIFT 1: Receive this 7-piece set with any Elizabeth Arden purchase of $48 or more. Yours with a Lancome purchase of $45 or more. See beauty gift with purchase at The Bay. Ship within Canada only, and free shipping with any $49 beauty purchase. New gift with purchase offers here. Free UK shipping on all orders over £40, £70 for European and £100 rest of the world. Pick 3 free samples with any order. Make sure you enroll to a free membership program NDulge. Sign up for free here. Space NK UK sale here. AND Every order get an additional two free sample and free shipping no minimum. 4 Free Samples – Yours with any order over £60 (Including 2 deluxe samples, subject to availability). Receive a complimentary Re-Nutriv sample with any Re-Nutriv purchase. See Estee Lauder Promotion page here. Ship to UK addresses only. See all gift with purchase offers at John Lewis here. Free standard delivery on all orders over £50. Ship to Australia, USA and Canada £10. (HOT) Five new Selfridges Beauty Boxes 2019 or Selfridges Multibrand Beauty Sets – starting from £105.50! Ships to 130 countries including US and Canada. 5-day shipping valued at is $30. If you are shipping outside of the European Union, we’ll deduct UK VAT and include any relevant local import taxes, duties and charges. Harvey Nichols UK Harvey Nichols Delivered to your chosen international shipping address. EXPRESS INTERNATIONAL DELIVERY to USA is $29. For international shipping please see delivery page. Here’s all beauty brands at Harvey Nichols. Don’t forget SIGN UP TO RECEIVE 10% OFF! Debenhams UK— Debenhams Beauty Discovery Box £35 or £17.50 with any beauty purchase. I’ve rounded up new gift with purchase offers below! See all beauty here. See all beauty gift with purchase offers here. Free shipping on any £40 purchase. Shipping fee to US and Canada £10. House of Fraser UK For UK, Free for instore pickup, FREE when you spend £50 or add £3.50. For US, free with any £120 order or add £6 for US shipping. David Jones Australia (NEW) David Jones DELUXE BEAUTY EDIT $49.95, Valued at over $400. Icangwp site contains affiliate links. Purchasing through these links help support the site and make it possible for icangwp to bring you all these sweet offers. Thank you!